Waterbug prop / drive test. I did some more welding to make the prop tower absolutely ridge. I did a dry running of the prop and drive at full power. Every thing looked true and I felt no vibrations or odd sounds. Had moved to it's extreme extent. prop speed. I was using my wooden 64" 34 prop. It spun up to speed as fast at I could move the throttle. I'm hoping the 3 blade 54" will load the motor a lot more, Or I'll need more prop. Re: Waterbug prop / drive test. Wow! That's a lot of power, D! You have room for a larger prop? I have a 64 now and could go to 66 max. I will increase the pitch on the 3 blade to get "MORE" prop. I will increase the pitch on the 3 blade to get "MORE" prop. Sounds like she runs good and maybe will run on the water a lot faster than you figured. Maybe rename her the Water Bullet? Have you considered a variable pitch prop ? I know they are used in some aircraft and most likely are not cheap. Need to way that against how much experimenting with this prop and that is gonna cost you. I have no clue what any of this actually cost. I got the elevator actuator hooked up and it moves them up and down, Yay . A tad slower then I planed but workable. I used a car window motor. That's a smart move, D! I would never have thought of that! 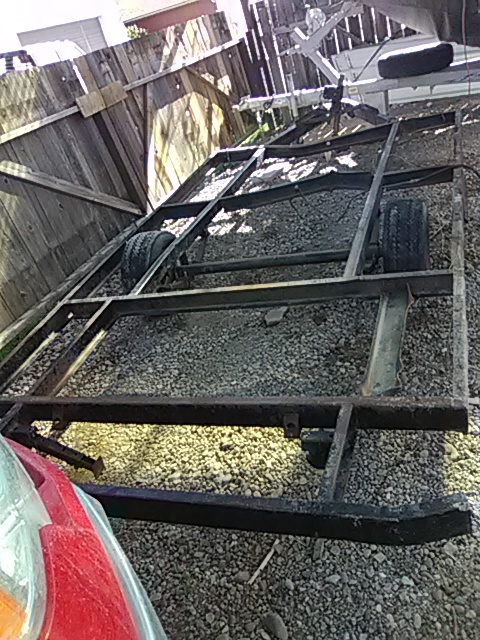 I found a trailer , needs some work ! 12 feet long, the deck. I got it for free, it has tires and a tidal. Can't beat free, D! That work you will have to do is minor to what you have already done, for sure. You already working on the trailer?